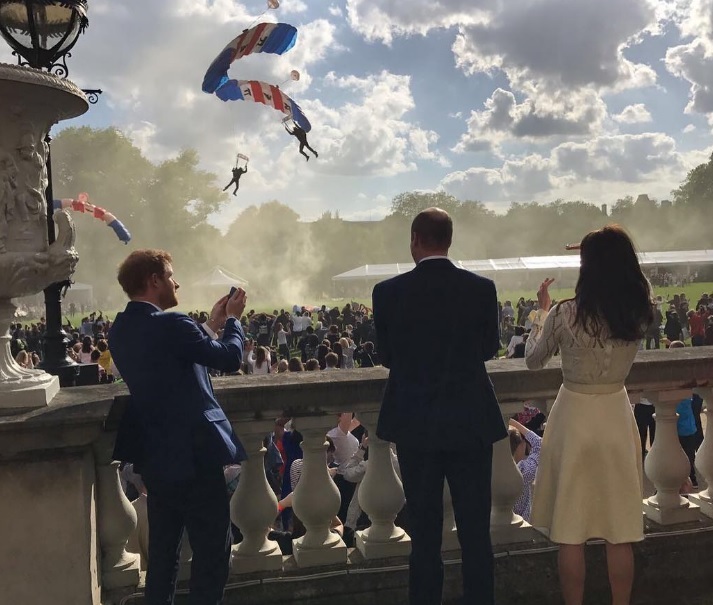 We're here to celebrate you - with those words, Prince Harry summed up what had led to an afternoon of fun on the lawns of Buckingham Palace. The grand old building is gearing up for garden party season but before it gets there, there was another, special event held in its famous grounds. Prince Harry along with the Duke and Duchess of Cambridge hosted a special party for children whose parents have died while serving with the Armed Forces. Here's a look back at the photo album from a royal party to remember. Around 850 children attended the party on May 13th 2017 with the hosts arriving as the action got into full swing. Buckingham Palace garden parties might be about cake and chatter but this event was about games and fun. There was face painting, break dancing and cupcake decorating. Entertainment came from Jess Glynne and Nina Conti while the children also got a chance to learn about beatboxing and breakdancing in workshops run by the Royal Foundation's Full Effect and Coach Core programmes. William, Kate and Harry joined in the fun. Prince Harry gave a speech in which he said ''We as a family....will never, ever, ever forget about the sacrifices that every single one of you has made.'' A party to remember at Buckingham Palace.